It’s going to happen eventually. Your love affair with those blunt bangs will run its course. Or your bangs will turn on you in an instant. It happens. One minute they look all cute and adorable. Then the next they are suddenly awkward and weird looking. The other reason you may want to grow out your bangs is you tried your hand at trimming them yourself and you had a “ooops moment”. In other words things didn’t quite go exactly as planned. Now you’ve got to live with that mis-snip for a few weeks and still look presentable enough to be seen in public without a bag over your head. For whatever reason you’ve decided you’ve had enough fun with bangs for now. Then the real fun starts. Because you want to grow them out. The sooner the better so you can get them out of your life. Yet because bangs are such an easy way to change your look without altering your overall style we can all identify with the pain of growing them out. Fact is you’re likely looking at four weeks or more for your hair to get to the point where it has grown out enough to move on to a more bang-less look. And things can get ugly very quickly if you don’t know some fast fixes. Fast Fix #1: Invest in some cute headbands and other hair accessories. They can be lifesavers and open the door to a variety of styling options. Bobby pins will also become your good friends during this unwieldy stage. You’ll want to get to know how to use them for the best effect. Fast Fix #2: As soon as possible see if you can’t incorporate the fringe into the rest of your hair using a French braid twisty look. You’re simply French braiding your bangs to the side and then bobby pinning the end and covering that with the rest of your hair on that side. Another way to do pretty much the same thing is to do a two strand twist. This look is both cute and easy. Fast Fix #3: Hide them for now. Part your hair to one side then pin the bangs under the side with the most hair. You’ll want to brush the section up front to cover them so things look nicely disguised yet neat and on purpose. Fast Fix #4: Sweeping the bangs to the side can help disguise them. Fast Fix #5: Make use of a bit of light hold gel and give them a healthy blast from your blow dryer to help hold them in place . Fast Fix #6: Pull them back, pin them in place, and cover the whole thing with a cute and trendy scarf. Pulled off your face like this, no one will even be able to tell you ever had bangs. Fast Fix #7: Tease the hair at the crown of your head including your bangs which you are going to pull back ala Gwen Stefanie. The idea is to develop a bit of a pouf and hold it in place with bobby pins and an ample amount of hair spray. Tie this in with an updo and you have a cute look that helps to camouflage your bang situation. 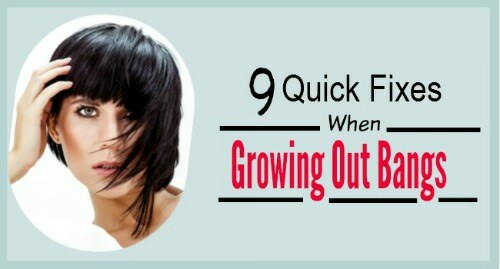 Fast Fix #8: As your bangs begin to grow out, now’s the time to play around with your part. If you usually style your hair around a middle part, see how a side part might help. If you part your hair on the side already, see how your look changes and the bangs blend in if your part your hair on the other side. Fast Fix #9: If you have thick blunt bangs get them thinned out just a tad. Angling them and taking out some bulk makes it easier to sweep your former bangs in with the rest of your hair. Here are five other ideas or variations of ideas shared for surviving growing out bangs. When the time comes to go bangless your hair will grow out in stages. Overtime it will become increasingly easy to blend them back into your hair with a touch of hair spray. But until then ideas like those shared here can help you live with them during their awkward grow out stage. Those seeking more than just bang up bangs will want to check out our boards on Pinterest. Do be sure to follow us, please?